I can be guilty of being too click happy with my online shopping. Rose gold and pink Birkenstocks? I ordered those with the help of half a bottle of wine this summer. They're cute but unnecessary. Not convincing faux leather leggings? I ordered those, completely sober, and then took the tags off before trying them on...I've since shipped them to ThreadUp and learned from my bad decisions. The internet can bring good things to my mailbox, and not everything I add to my cart comes with buyers remorse. One impulsive purchase that I'm totally satisfied with is my Care/Of subscription. 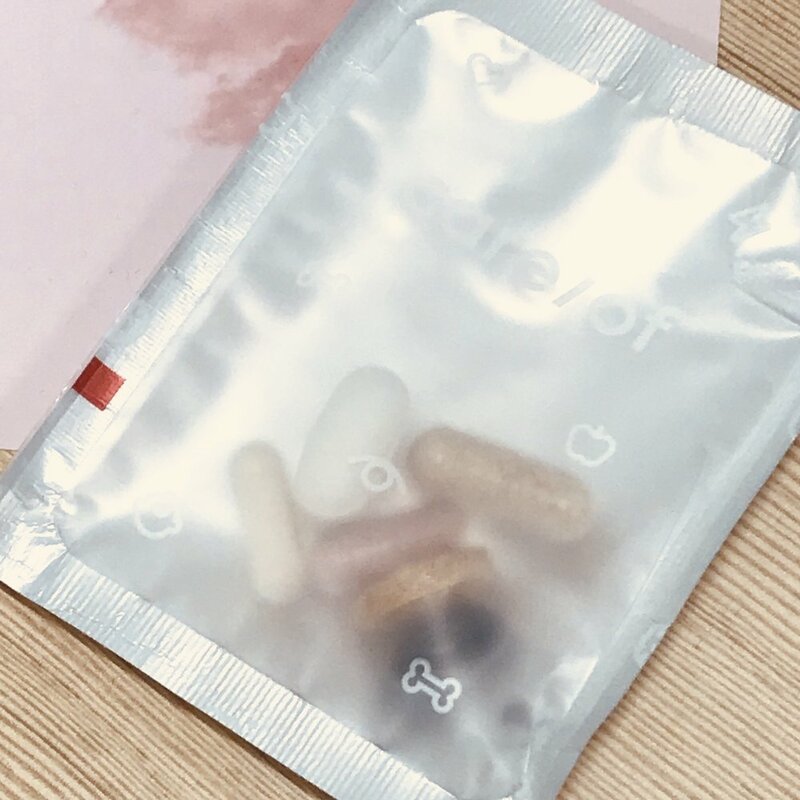 These personalized vitamin packs are designed for you and you alone. I took a quick health-oriented quiz on their website to figure out what I think my biggest problems are, and then they give their more educated two-cents about what I might need help with, and suggest a routine of supplements to take with breakfast. 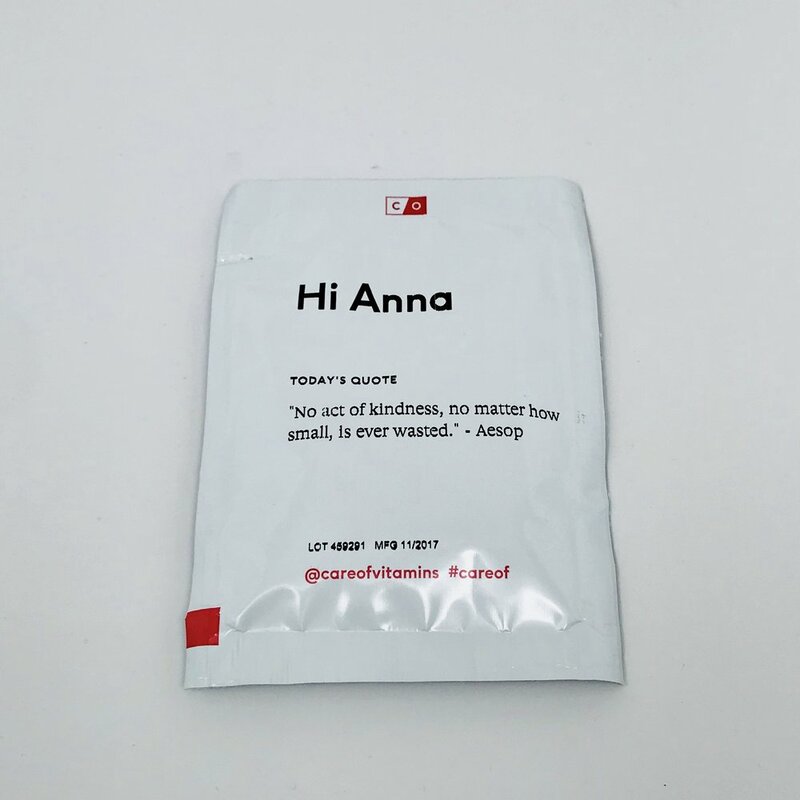 Each of my personalized packs (which have a fun facts and inspiring quotes on them) has the following supplements: a probiotic blend, vitamin D (I live in Vermont - very necessary to help with SAD), ashwagandha, b-complex, astaxanthin, and magnesium. Some of these would've been a no brainer to me to add to my regimen on my own, but I never would've considered taking some of the more obscure additions to my pack. I'm willing to try it all, though, in the name of good health! And better skin! And better sleep and digestion! I also really appreciate the packaging of the product - you get 30 little daily packs in a larger, design-coscious dispenser that looks right at home on my desk next to my faux succulents. Are they working? Time will tell, but I know that vitamin D and probiotics are things I should definitely be adding to my diet, and after some Googling, I think that the other additions to my regimen can only help in the long run. Obviously, talk to a real health professional if you're thinking about adding any supplements to your diet, as they can have real and dangerous interactions with other medications or imbalances that you might have. P.S. I paid for these vitamins all by myself, and all views expressed in this post are solely my own.